Home › For Pastor's › ok, feed the sheep. but which ones?!? ok, feed the sheep. but which ones?!? This, it has to be said, is counter-intuitive. It goes against the grain. Our first instinct is to go straight to those who need the most help–and of course, as pastors, there will always be times when we need to leave the 99 to go after the one. There will be pastoral emergencies and problems that we just have to deal with. But if we pour all our time into caring for those who need help, the stable Christians will stagnate and never be trained to minister to others, the non-Christians will stay unevangelized, and a rule of thumb will quickly emerge within the congregation: if you want the pastor’s time and attention, get yourself a problem. Ministry becomes all about problems and counseling, and not about the gospel and growing in godliness. And over time, the vine withers. So, what is the point of what we are doing? 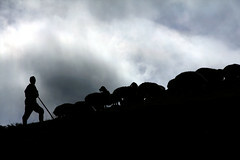 Managing bleeting sheep, or investing in the kingdom? ‹ Personal, Gone Private, Gone Pagan. As a pastor this really applies to me. I am am drawn to the hurting…but what about pouring my life into a Timothy? Need to remember there is only one savior per universe…and it’s not me 🙂 thanks for the post, David. Jim, I think that it is something that we all wrestle with, but the fruits in the long run pay off much greater to equip the Timothy’s of our churches to engage people, so we are kingdom focussed instead of problem focussed. And I also think that as pastors we need to do a better job towards this end of providing the accountability for other pastors to be doing just that.